Competition has been described as the most demanding according to international media such as National Geographic. Chelsey Gribbon is American. During a long time she prepared for the Patagonian Expedition Race, one of the toughest races in the world, held in the Magellan Region. Two days before the race, she lost a four-week pregnancy. Therefore would not participate in the competition. But when she faced her possible replacement, she realized that another one would replace her, that another muddy and exhausted would sleep with her boyfriend in a small tent, and that she would miss the race of her life. Then she decided to do it. The first 36 hours of travel every joint of her body was hurting. And she had never felt so hungry. It was cold and windy there. Her boyfriend had to carry her backpack for almost 21 miles without resting. Finally, the Gribbon team was fourth in the competition. Chelsea said yes and this year with her team they are racing again. “Many live on the edge of experiences, but they return. There are many examples of teams that have been lost for a couple of days in the middle of nowhere and without food,” says Stjepan Pavicic, creator of the competition. Is the most wild and demanding race. The competition has been described as “the most demanding or wild race” according to magazines such as National Geographic Travelers, Men Fitness of the UK, or Australian Geographic. In its ninth year, the route will only be delivered with 24 hours in anticipation to the 15 competing teams from Europe, Asia, Africa, Oceania and the America. However, Pavicic anticipates that this year Torres del Paine (see computer graphic) will be the starting point, the Southern Ice Field was included in the itinerary and the goal will be located 550 km south of the starting point in a volcanic crater. 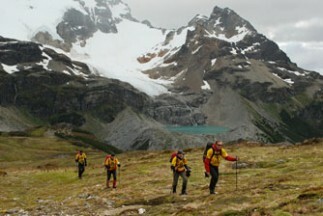 The race will be held from February 8 to 16, 2011, and the registration form may be accessed at: www.patagonianexpeditionrace.com. Anyhow, competitors are chosen for their experience in other international competitions. In 2005 a full team disappeared while walking 110 km in a geographically inhospitable place. They realized after three days, when all teams had already reached their bases. The organization and athletes began to worry. The hours passed and did not communicate either by radio or satellite phone. According to the creator of the expedition, some athletes tell that the level of fatigue is such that “have seen cougars in Tierra del Fuego, and there are no cougars.” He reports that there are those who say green eyes are following them. For the creator of the competition, everything is the result of fatigue. This environment that is generated and to which these human experiences are added, vegetation and the desire to achieve a goal, are the attributes that each day attract more athletes from different countries. “The impact is tremendous, we managed more than 800 articles in press media such as National Geographic Traveler, The New York Times, media from Japan and even China,” said Stjepan Pavicic on the dissemination of the race outside of Chile. As well, this year’s competition obtained more than 52 thousand minutes on television, distributed in 182 countries through over 220 channels. The figures are comparable to those generated by the Chile-Argentina Dakar Rally. This contributed to the country’s visibility abroad, approximately 35 thousand minutes of television. In the same manner, the expert states that the concepts behind the Patagonian Expedition Race are ideas that “are relevant today: such as how to be friendly with the environment, being respectful of our natural and cultural heritage. All these features are very present on our competition.